Land care staff doing biomass treatments in the Francis Hole plots. Ecosystems are dynamic, with vegetation and animals changing seasonally and over long time periods. Monitoring is an important scientific practice of taking systematic, repeated measurements of various features (for example, water quality, plant and animal diversity, and phenology). The same methods are used over time in the same places so that long-term comparisons can be made. Monitoring is conducted by Arboretum staff, faculty, and students from UW–Madison and other area colleges, citizen scientists, and partner organizations such as the Wisconsin Department of Natural Resources, Madison Audubon Society, and The Prairie Enthusiasts. These and other individuals and organizations provide expertise and support in a wide variety of areas including plant and animal monitoring, habitat monitoring and mapping, soil structure, invasive and rare species monitoring and mapping, native pollinator surveys, (esp. bees and bumble bees), stormwater and ground water quality, and daily weather attributes. Selected monitoring projects are described below. Monitoring projects that rely heavily on citizen involvement, such as studies of bumble bees, dragonflies, birds, bats, frogs and toads, phenology, water quality, and more, can be found on our Citizen Science page. The restoration begun in the 1930s, now called Curtis Prairie, is considered to be the world’s oldest restored prairie. To monitor the diversity of native plant species as well as the invasion of exotic species, the prairie has been sampled intermittently over the decades. Using a grid of sample points, researchers have recorded plant species since the 1950s. In 2002 Global Positioning System (GPS) was used to establish more precise sample point locations. Several research projects done in conjunction with monitoring in Curtis Prairie have provided insight into the effectiveness of restorations, plant species diversity and changes, and the effectiveness of fire and cutting in managing restored prairie. A visualization of native species diversity data from the 1976 Greene Prairie sampling, with the range from least diversity (brown) to highest (blue). 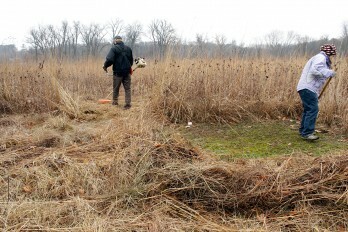 Greene Prairie was carefully hand-planted by Dr. Henry Greene, the late UW–Madison botanist and prairie expert, so that species distributions resembled remnant prairies he had studied in depth. Similar to Curtis Prairie, Greene Prairie vegetation diversity has been intermittingly sampled since the 1950s, with the most recent survey conducted during the 2012 and 2013 growing seasons. 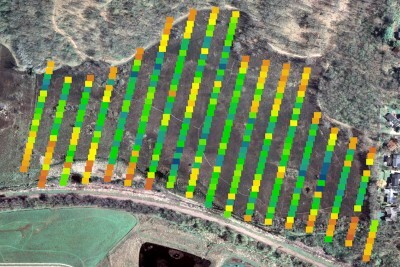 In the latest sample, a new grid, modeled after that used in Curtis Prairie, was adopted to more easily compare vegetation between the two sites. Stormwater flows into the prairie have facilitated the establishment and spread of reed canary grass, a common invasive exotic species, over 10 acres. The boundary of this invasion is mapped annually using GPS. Monitoring data suggests that the size of the invasion has not increased in the past five years. Researchers and managers are developing plans to restore this area back to native vegetation. Noe Woods historically was a black and white oak savanna. Changes in the density, occurrence, and size of trees have been assessed by classes in the UW–Madison Advanced Plant Ecology course since 1956. UW botany professor Dr. Tom Givnish now oversees the project. Long-term monitoring shows that oaks are not reproducing enough to sustain dominance and that weedy trees like box elder are gaining in abundance, likely due to the cessation of fire brought on by human settlement. In 1956, soil science professor Dr. Francis Hole established field plots that continue to be used to monitor the role of plants in maintaining soil structure. These involve simple, manipulative treatments of ground litter in Wingra Woods, Noe Woods, and Curtis Prairie. Each plot is divided into four sections, and one of four treatments is applied: (1) plant biomass is cut and removed from the plot site, (2) plant biomass is cut and left in the section, (3) plant biomass is cut at the end of the year and added to (2), and (4) a control, with no manipulation. The plots in Curtis Prairie are excluded from prescribed burning, and each has a nearby plot that is included in burns and receives no other biomass treatment. Arboretum staff maintain the treatments, and interested researchers sample the outcomes from time to time. Monitoring and mapping of established and new populations of invasive plants and animals is a continuous project at the Arboretum. Quantifying the location and spread over time helps staff assess impacts to plan and implement control strategies. More than 460 million gallons of stormwater flow through the Arboretum every year. This water is high in nutrients such as phosphorus and nitrogen, total suspended solids (primarily sand), and road salt. In addition, flows from large storm events can cause significant soil erosion. These factors can facilitate the establishment and spread of aggressive, non-native species that may outcompete native plants. Stormwater samples are collected throughout the growing season to track water quality. Thanks to a 2014 donation, the Arboretum acquired four automated sampling units that can be used for more continuous and precise water quality sampling during storm events. The Arboretum is a permanent weather monitoring site with National Weather Service (NWS). Daily temperature and precipitation amounts are recorded and archived on the NWS website for use by staff and researchers.